The MySims franchise generates more spinoffs than the Law & Order series, but Racing seems to be one of the good ones. The game features many recurring characters from the original cutesy life simulation on the Wii, such as Dr. F and Chef Gino. Like MySims and MySims Kingdom, Racing is organized around Sim towns that require the player's help to beef things up and make everybody happy. But instead of building things, going on quests or bolstering the local economy by buying stuff, this game asks the player to win races and complete racing challenges to help the local population thrive. And that would be why it's called MySims Racing. MySims Racing is a go kart game for the Wii and DS that supports four player versus (on single or multiple cards for DS). Players can use the Wiimote –Nunchuck control setup, sideways Wiimote, GameCube controller or Wii Wheel to play the game. I spent a little under an hour with the game in an EA representative's posh apartment. Don't give me that look – it was strictly business. The build looked near-final. The game is coming out June 16. Divorce the Sims: This game isn't about being a life sim, it's about racing. So why does EA need to keep it married to the MySims franchise? If anything, that alienates gamers that might otherwise get into the game for the sheer fun of racing. Who Just Shot At Me? : There are so many Sims on the racing track at one time that's it's hard to tell who just shot you with whatever "power up" (the Sims don't have "weapons"). Unlike Mario Kart or even the old school Diddy Kong Racing on Nintendo 64, the MySims' vocal gibberish isn't enough to tell the NPCs apart. You'd actually have to look behind you to see who shot you with down on the D-pad, but it's risky and the tracks are so long, you probably couldn't be sure which Sim to hate. Cluttered tracks: MySims Racing relies on three different types of crystal from MySims as currency to pay for upgrades to you customizable kart. 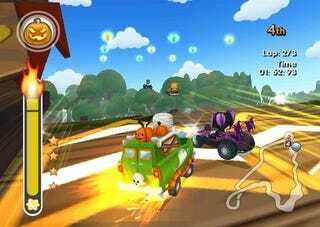 Between the different crystals plus the present boxes that contain power ups and the different obstacles and the boost platforms, the tracks can get cluttered very quickly – especially when other racers start dropping traps. Kart customization: Using the currency that you pick up from different tracks, you can change pretty much everything on your kart from the engine to the body. Different parts affect the handling, top speed and weight of the kart, while special parts obtained from completing challenges can give you bonuses to handling, speed or weight. Frenetic Pace: To me, what separates a kart game from a "serious" racing game is the pace. In a real racing game, the pace is steady; so if you happen to spin out and hit a wall, it's very hard to get back in the top three. In a decent kart game, the pace is frenetic such that you could still come back and win it even if you caught purple shell in the final lap. Frenetic pacing keeps kart racing fun even when you're constantly getting nailed by vindictive AI – a lesson Mario Kart Wii seems to forget. Familiar territory: If you've ever played a kart game, you will not need much of an explanation to play MySims Racing. The karts control exactly like you'd expect them to (A to go, B to drift or break, C to deploy pickups, etc. ), the courses scale from basic to elaborate at a steady rate and the gameplay is a mix of being the fastest and getting lucky with the power ups. The game feels more like Mario Kart 64 than Mario Kart Wii did – and that's saying something. I'm on the fence about the motion controls in the game. Some of it's basic, like jerking the Wiimote upward to perform a jump, but then there's the elaborate stuff that could be getting into "tacked-on" territory. Like when you hit a wall or when a certain power up is inflicted on you, the game requires uses playing with the Wiimote-Nunchuck combo to shake the Wiimote to "clear" the screen. When I saw someone else doing it, it looked stupid, but when I did it, I barely noticed it. However, it got awfully annoying when the same screen-blocking power up hit me three times in a row. The bottom line for me is that this is a game that does everything it promises to do and doesn't make any silly pretentions toward reinventing the go kart racing wheel. I would gladly buy this game for a child and probably play it with them, too. Thought I wouldn't be caught dead playing it alone – I've got a reputation to maintain and there are no classic Nintendo characters to justify my Wiimote flailing.